PDF Table Extractor is a very usefule software designed to export PDF table data into Excel sheet and CSV files. This software support two kinds of output formats: Excel sheet and CSV files, besides, users can also define table columns according to their own needs which do help users a lot. In this artile , the users can learn to design the table columns based on their needs. No need for third party PDF application. Support for Mac OS X v 10.5, 10.6, 10.7 and so on. Support saving PDF table data to both Excel sheet and CSV files. Support Previewing the PDF pages in the interface. Support define the columns manually. Support one column setting to all the other PDF pages. Support previewing the table division instantly. Main steps on how to extract PDF table data into Excel sheet or CSV files. Click the button”Open ”and add the PDF files into the interface, the PDF pages will be previewed on the left panel of the interface. The current page will be displayed in the central part of the interface, with the button”Up”and”Down ”users can choose the previous and following pages. Users can also zoom in and out the pages with the”Zoom In”and “Zoom Out” button. Select the text area with the “rectangle“ button and draw vertical lines with the button to seperate the text into different columns which will be extracted into different column in the Excel sheet later. The Excel sheet will be previewed in the lower panel of the interface.With this software, users can define the table columns according to their needs. 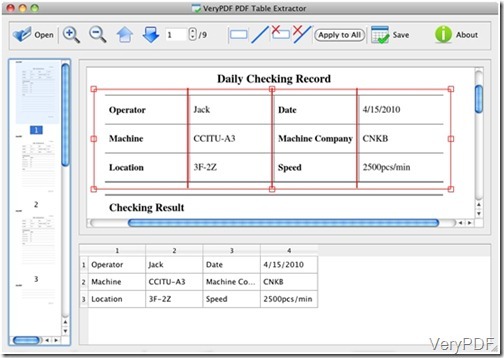 If a blank column is needed , users can draw two vertical lines in the blank part with the mouse; however, if certain table or line are unnecessary, click the buttons . If the column division setting is needed to be applied to all the PDF pages, just click the button”Apply to All”. Click the button “Save ”and two output formats are provided to choose from: Excel sheet and CSV files. Users can free download this software and turly experience the advangtages of this software, If you are in trouble with such problems , do not hesitate to experience this software and it will not disapoint you! How to create PDF document with virtual printer? How to delete text comment on the current page in the docPrint preview application? How to convert Word to PDF and set page size via command line? Convert pcl to pxl and set resolution via command line? Convert prn to pdf and set page size via command line?